Hourensou no goma-ae (菠薐草の胡麻和え) literally translates to "spinach dressed with sesame seeds". If that sounds simple, that's because it is. With only a handful of other ingredients, it's a quick Japanese salad that's served as a side for breakfast, lunch or dinner. 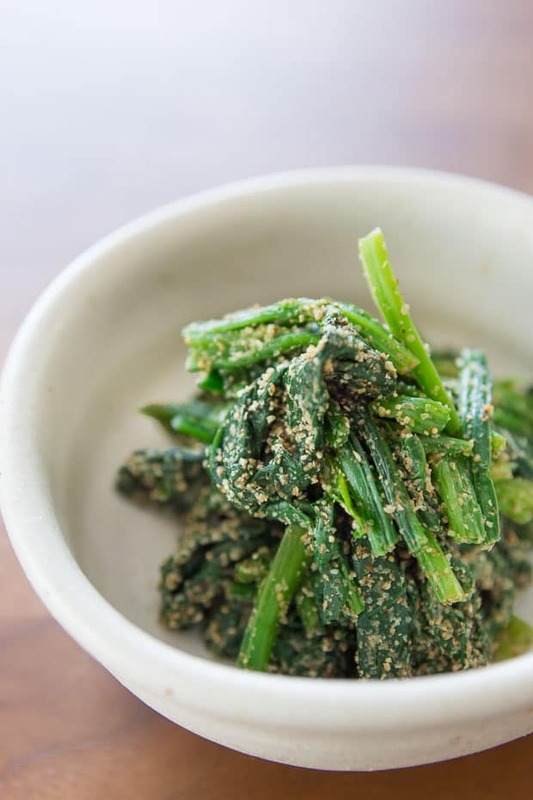 While the nutty sesame and verdant spinach are the dominant flavors, goma-ae is also smoky, subtly sweet and full of umami, thanks to the dashi-based dressing. 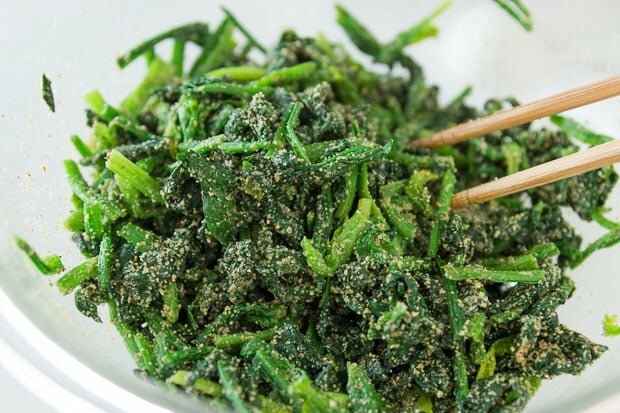 Hourensou no goma-ae (菠薐草の胡麻和え) literally translates to “spinach dressed with sesame seeds”. If that sounds simple, that’s because it is. With only a handful of other ingredients, it’s a quick Japanese salad that’s served as a side for breakfast, lunch or dinner. While the nutty sesame and verdant spinach are the dominant flavors, goma-ae is also smoky, subtly sweet and full of umami, thanks to the dashi-based dressing. 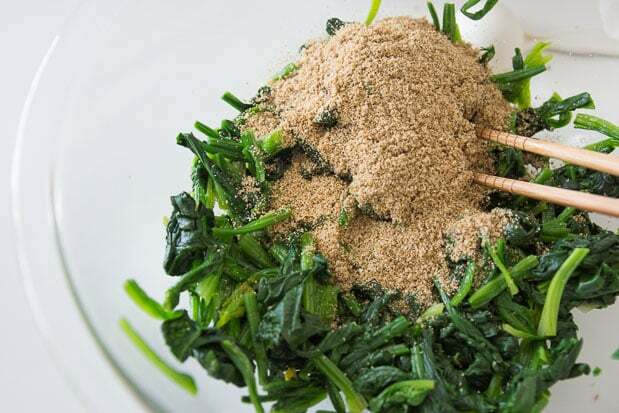 We all know that spinach is loaded with vitamins A and C, but by pairing it with sesame seeds, this dish is a more complete source of nutrients, replete with protein, fiber, calcium, iron, magnesium and vitamin B-6. Best of all, it will keep refrigerated for a few days, so you can make a big batch during the weekend and enjoy your goma-ae during the week. Although I use toasted sesame seeds, I prefer toasting them again just before using them. Like spices, the flavor of sesame seeds degrades as they sit on a grocery store shelf, by giving them a quick toast, it resurrects some of that lost nutty goodness. 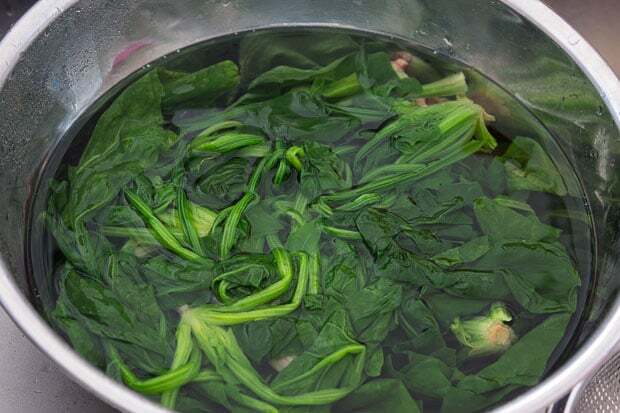 While spinach is the most common vegetable for making goma-ae, it’s also made with green bean, carrots, or almost any leafy green. Bring a very large pot full of water to a boil and prepare a bowl of ice water. Cook the spinach in the boiling water for 2 minutes. Drain and spinach, rinse briefly with cool water, and then dump the spinach into the ice water. Retrieve the spinach by the pink roots, and squeeze out as much water as you can. Chop the roots off and then cut the spinach into 2-inch (5 cm) long pieces. In a medium bowl, whisk the dashi, soy sauce and sugar together. Add the spinach to the bowl and toss well to distribute the sauce evenly. 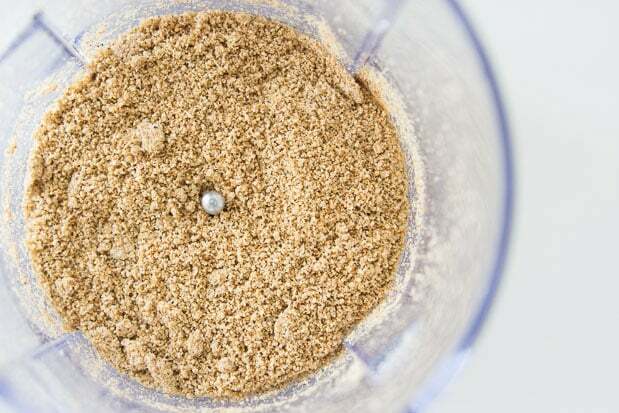 In a small food processor or blender, add the cooled toasted sesame seeds and salt and process until the sesame seeds are ground and start to look like wet sand. Dump the ground sesame seeds in with the spinach and mix to evenly distribute. 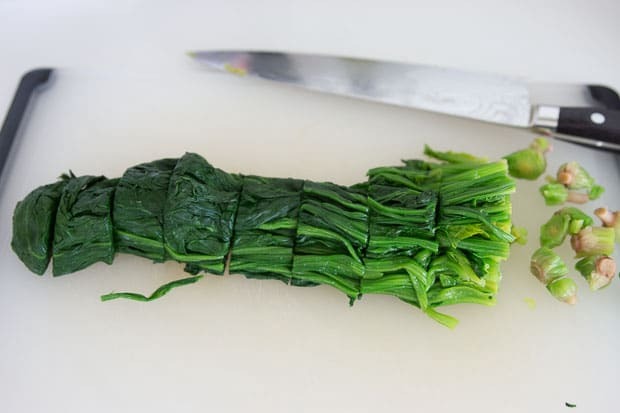 Have you ever tried this with raw spinach? I’m not a huge fan of cooked spinach, but love it raw. And the dressing looks so yummy, I want to try it. Hi Ashley I don’t think it will work because this dressing has no oil. Oil in dressing increases the viscosity and helps the dressing stick to raw veggies. Just adding oil won’t work either because there’s nothing to emulsify the oil and liquid. When vegetables are cooked and squeezed they turn into a sponge that soaks up liquids you pour over them, which is why this dressing is really geared towards cooked veggies. Hope that helps! I use tahini sometimes as a substitute and it’s very quick. just make sure you get tahini with no added salt. Hi tata, tahini makes a decent substitute for nerigoma (sesame paste), but it’s not really a suitable substitute for surigoma (ground sesame) as it needs to have some texture remaining (should be more of a rough powder than a paste). Also, tahini is made by grinding hulled sesame seeds. Japanese nerigoma and surigoma are made from while sesame seeds (including the hull), this effects the flavor, texture and nutrient content. This was definitely a favorite of mine when it showed up in kyushoku. Thanks! 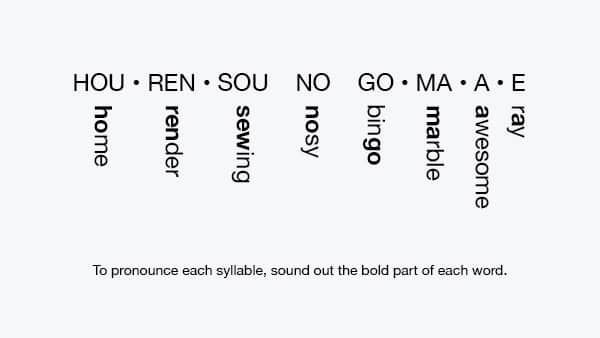 Oh, that makes sense, thanks! I shall try the recipe as-is then! Tried it today. Was great! Thanks a lot. How could this be made equally good without the Dashi, and don’t want to use MSG?? If you can’t find the ingredients for making dashi, then you could use a different soup stock, but making this without dashi is kind of like making a pomodoro sauce without garlic or onions. Some crushed lightly toasted peanuts will add a whole other dimension to this already excellent dish! Hi Marc, I love your blog and inspire me to cook Japanese food. My question is, can use Kombu as a dashi? Hi Atkinson, I’m glad to hear you enjoy the blog! Yes, you can use a dashi made from just konbu for this.